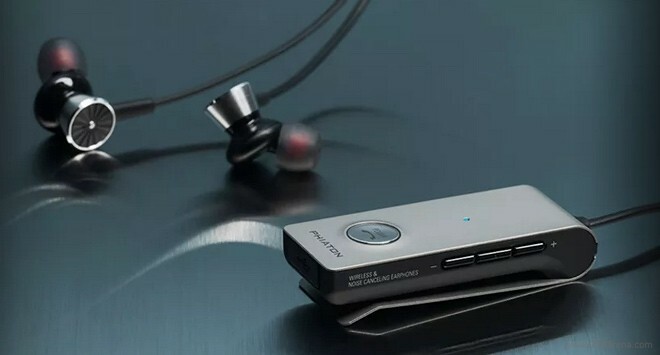 Phiaton BT 220 NC is the Korean manufacturer’s latest wireless in-ear offering. The noise-canceling Bluetooth 4.0 headset replaces the already stellar Phiaton PS 210 BTNC on top of the company’s in-ear lineup. In past encounters, I found Phiaton headphones to offer a good balance between design, build quality, sound, and value. Read on to find out if the BT 220 NC matches the standards set by its predecessor! Like its predecessor, Phiaton BT 220 NC ships in a well-appointed retail package. Inside the nice looking box, you will find the headset, a carrying pouch, microUSB charging cable, five sets of ear tips including one Comply Foam, a neck strap, and an audio cable. A set of booklets completes set of contents. As far as retail packages go, you will be hard-pressed to find a better one than the BT 220’s. All your needs are covered right out of the box. Phiaton BT 220 NC looks sleeker and more upmarket than its already premium predecessor. The newcomer features an aluminum body as opposed to plastic on the PS 210. The older model’s joystick has given way to a single button, which also looks much better. The majority of BT 220 NC controls are located on its sides, thus giving it a nice, uniform look. The earphones have retained the propeller-like pattern. Sadly, the latter is not a two-tone solution like in PS 210. Overall, the headset looks as good as its considerable price tag requires. Phiaton BT 220 NC is handsome in the flesh as are most of the manufacturer’s other products. Build quality of the headphones is good, save for one aspect – I found the aluminum finish of the BT 220 NC prone to light scratches. The marks don’t affect the functionality of the headset, but are surely annoying to look at. The headset is backed by a one-year warranty. Finding the a right fit for the earphones of the Phiaton BT 220 NC is easy thanks to the large number of ear tips. The clip of the headset is solid and offers better fit than its predecessor. The bundled neck strap will work for those who are not keen on attaching the device to their clothes. Pairing the headphones to a device is easy. You can do it through the device’s Bluetooth settings or via NFC. The BT 220 NC supports multi-point connection – you can use it on two devices simultaneously. All buttons on the headset are easy to access without looking. Phiaton has added a monitor button that turns off playback and noise canceling for those moments when you need to be aware of your surroundings. The battery of the headset is quoted as capable of providing 16 hours of playback and 500 hours of standby time with noise canceling turned off. Real-life performance depends on the volume of playback and whether or not you use noise canceling, though, regardless of the scenario, battery endurance is stellar. In case your headset runs out of juice, there’s a bundled 3.5mm audio cable that will keep you going. The microUSB charging solution on the other hand allows you to easily top up the battery. Phiaton BT 220 NC packs the same size driver as the model it replaces. The 14.3mm solution is massive for an in-ear headset – it is significantly bigger than the usual 10mm found in the segment. The frequency response ranges between 10 Hz and 27 kHz. Impedance and sensitivity are 32 Ohms and 100dB respectively. Noise cancellation is activated via a dedicated button and works well. I doubt that you will ever switch it off once you experience it. Audio quality of the phone calls is good. The sonic experience offered by the Phiaton BT 220 NC is superb thanks to the massive audio drivers it packs. The newcomer packs expanded frequency response range in comparison to the PS 210 (15 Hz to 25 kHz) and the end result is an even better sorted sound signature. Bass is rich and powerful, while treble comes out crisp and well-pronounced. Traditionally an achilles heel for many in-ear headphones, the mid-range of BT 220 is also well-defined. Overall, the headset offers pleasurable experience regardless of the style of music you will play on it. Phiaton BT 220 NC offers better sound, improved connectivity, and sleeker design that its predecessor. Overall, it is a worthy update to an already impressive headset and one of the most capable wireless in-ear offerings for the money. The prone to scratches body of the headphones is extremely annoying. I cannot confirm that it is a widespread issue for the model at this point – it could be the fact that I reviewed an early product sample of it. I surely hope that this is the case for my woes. Phiaton has priced its latest offering at $159 on Amazon. For the same amount of cash, you can also pick up LG’s superb Tone Infinim, which will offer better ergonomics, but slightly inferior sound. If you are in a mood to save some of your hard-earned money, you can also opt for the Phiaton PS 210 BTNC (currently available for $99).